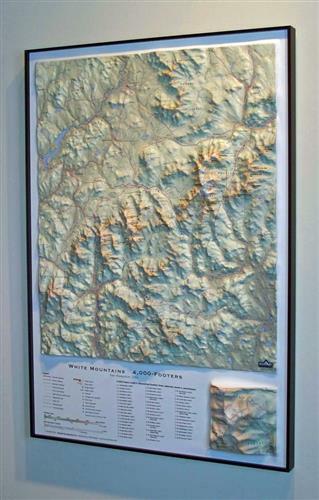 This beautiful raised relief map by Summit Terragraphics shows all of the White Mountain 4000-foot peaks. Also shows trails, roads, streams, ponds and many other summits. At bottom is a list of the 4000-footers and an inset raised relief of Mt. Washington. Scale is 1:125,000. Overall size 32” X 22.” Unframed.